Your perky pup has special nutrient requirements because of her tender age, and without these essential nutrients, she may not be so perky. To restore the perk to the pup, here are the Top 10 Puppy Food Brands of 2019. If you’re serious about nutrition, Timberwolf Legends is the way to go. The manufacturer states that it does not formulate for taste, smell, or color, so there you have it. 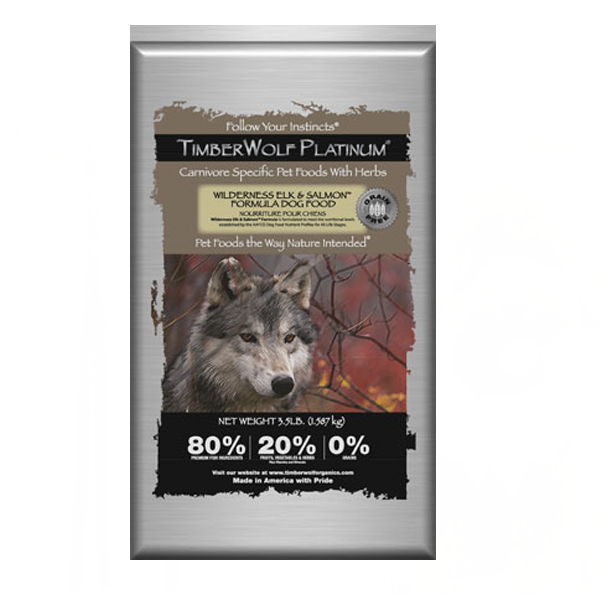 Only concerned about nutritional value, Timberwolf Legends features all-natural ingredients such as elk, salmon, pumpkin, flaxseed, kelp, beets, watercress, and much more. It’s practically an entire produce section in a convenient bag made just for your pup! Concerned about dog food safety? Natural Balance is the way to go. Formulated by nutritionists, this kibble’s got its bases covered. 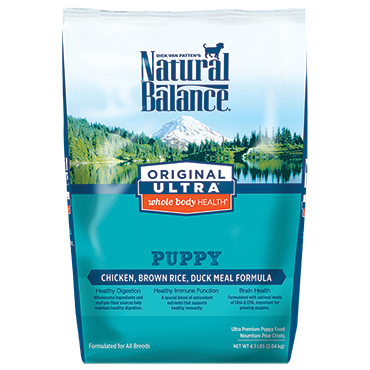 As its name implies, this well-balanced puppy food aims to promote optimal nutrition for all parts of your pup’s growing body, including the heart, eyes, bones, and teeth. Featuring small kibble designed for petite mouths, your mini pup will have no trouble chewing or digesting. 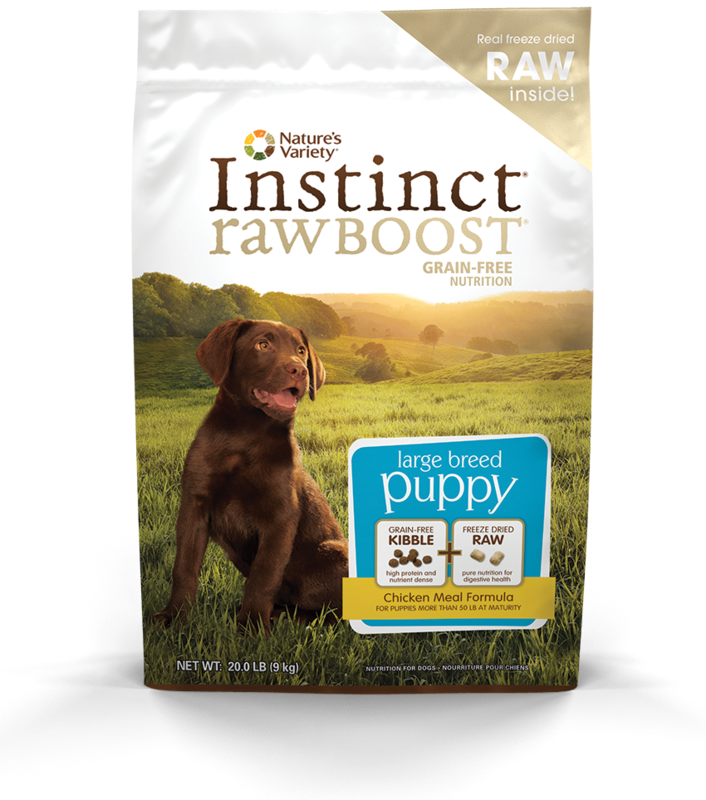 And because Natural Balance performs nine safety tests on each batch of food, you can rest assured that your pup will be well-nourished. 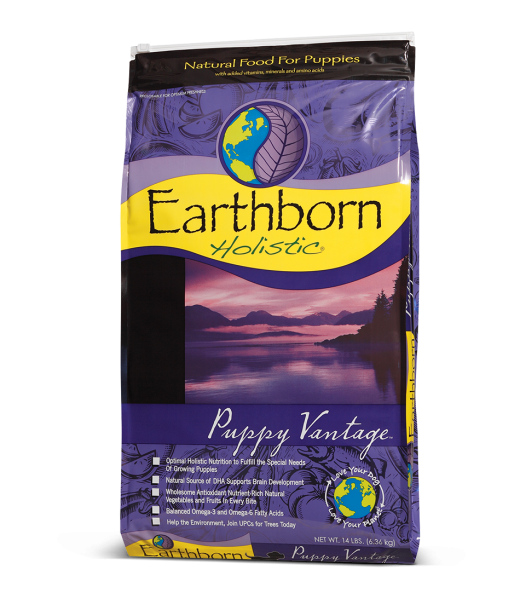 Not grain-free, but still loaded with power, Earthborn Holistic strives to support your pup’s muscle and bone growth with whitefish meal and chicken meal. Nutrient-dense carbs like brown rice and barley soothe your pup’s sensitive tummy. And in case your intelligent pup wants to participate in the annual spelling bee (or just chase a bee), added DHA will nurture her brain and eye development. 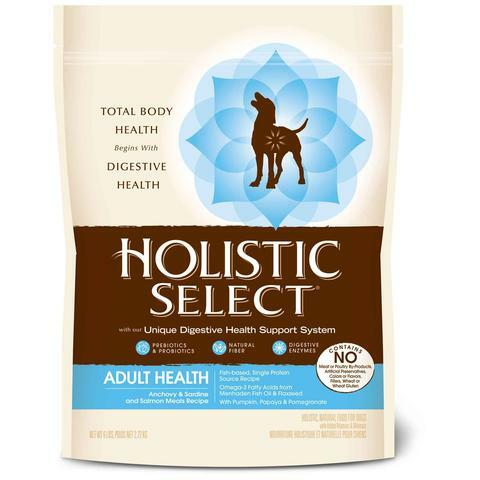 With many flavors to choose from (including duck, lamb, and sardine), Holistic Select nurtures large-breed pups with superior nutrition. Designed with a larger kibble size, it combines prebiotics, probiotics, fiber, and enzymes to make your pup’s digestive system a well-oiled machine. And most importantly, it contains only premium ingredients, with no animal byproducts or fillers. This small-sized kibble packs a punch. 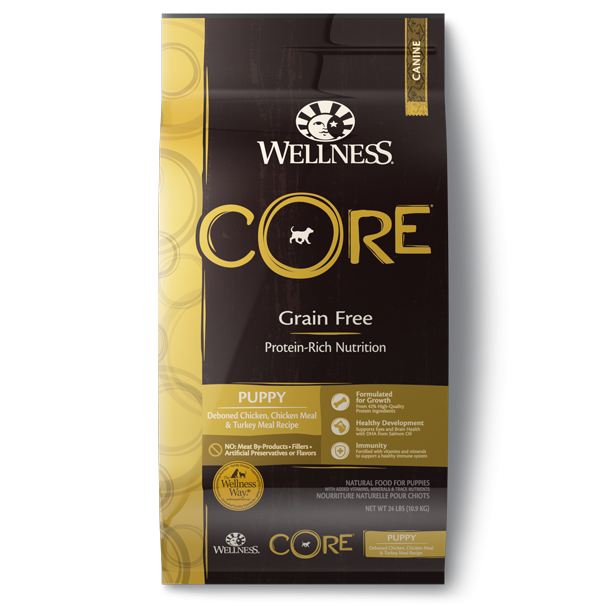 Made with the philosophy that puppies thrive on a high-protein diet, Wellness CORE contains no animal by-products. Only the real thing. It is fortified with vitamins and minerals, including Omega-3 for a healthier coat. Your pup will beg for more, and you’ll gladly comply. Unrecognizable “meat” ingredients are a thing of the past. 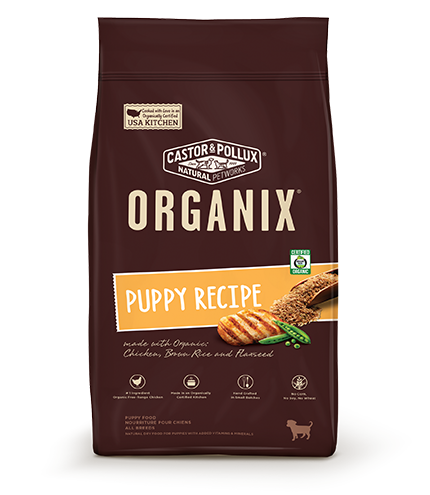 Organix is revolutionizing kibble production by using organic, free-range chicken as its number one ingredient. In fact, in this kibble, all the produce is organic as well. That means your precious pup will never consume yucky pesticides, fertilizers, hormones, or antibiotics! You might spend more on this kibble now, but avoid expensive Vet bills later. Pamper your pup with this high-protein, gluten-free, all-natural kibble. In this case, what is left out is just as important as what is put in. Nature’s Variety doesn’t contain corn, wheat, soy, or fillers, which can trigger doggie food allergies. But it does feature nutrients that support eye and brain development, bone growth, and a healthy coat. You can’t go wrong with this doggie dish! Whether you have a large or small breed, this doggie delight is sure to be right! It boasts industry-leading levels of Glucosamine and Chondroitin to support your pup’s joints. 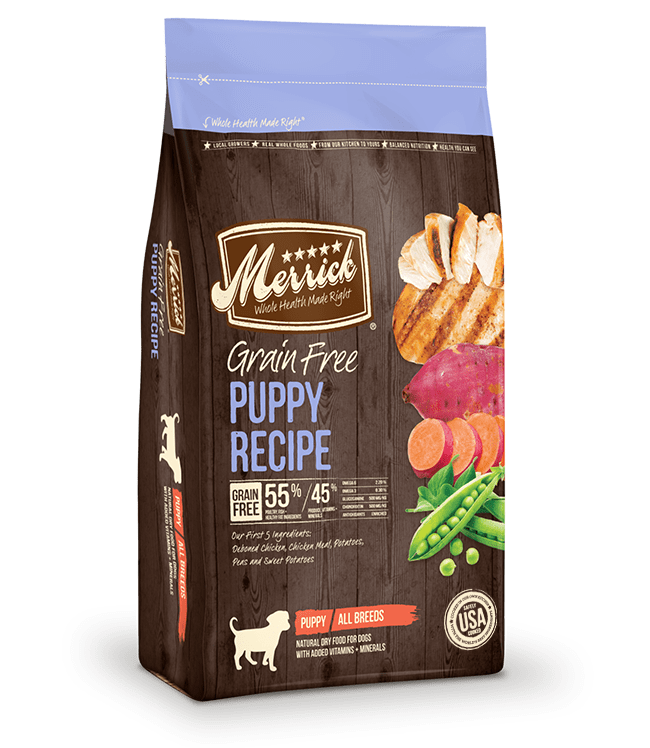 With ingredients sourced from local USA farmers, nutrient-dense foods like deboned chicken, peas, and sweet potatoes are sure to tantalize your pup’s taste buds. This kibble is designed with your pup’s ancestors in mind! 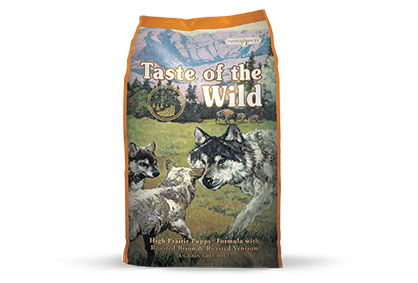 Just as wild wolves chow down on real meat, so will your wild pup. Meant to support your four-legged friend’s digestion, this formula features probiotics (symbiotic bacteria) and plenty of veggies to keep your pup regular. Not only that, but added fish oil will allow your dog to run without joint pain for years to come. 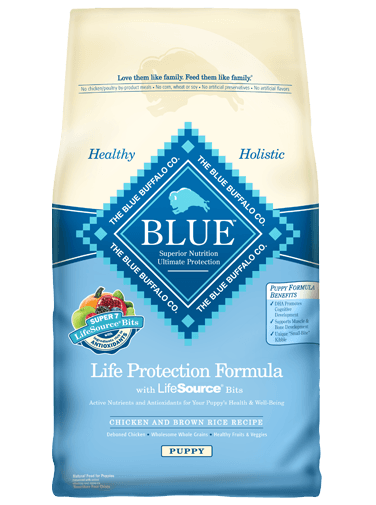 Made in the USA, Blue Buffalo’s patented “LifeSource Bits” combine a precise ratio of vitamins and minerals that your puppy needs to grow big and strong. The manufacturer believes that you should treat your dog like family, starting with what you feed her. So this dry food contains real meat, whole grains, garden veggies, and fruit. It does NOT contain meat by-products, wheat, soy, artificial colors, or preservatives. This kibble comes in many shapes and sizes, so no matter your pup’s stature, she can enjoy these tiny morsels of goodness. When it comes to nutrition for your little furry friend, choose wisely! The food she eats now sets the course for her future health. Do not choose cheap, generic adult food. Until your pup’s first birthday (depending on breed size), feed her puppy food! Puppies have special needs, and additives, fillers, and preservatives are not the answer! But with a high-quality kibble designed for puppies, your little one will be well on her way to a lifetime of health.